The right-wing political party Alternative fuer Deutschland (AfD) has walked out of a meeting in Germany with the country's central council for Muslims. 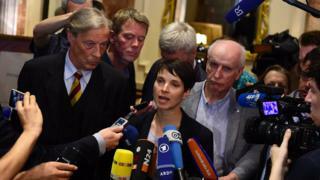 Its leader Frauke Petry said the Muslim council refused to retract a comparison between the party and the Nazis. Earlier this month, the AfD adopted an anti-Islam policy. Attacks with a far-right motivation reached a 15-year high in 2015, the German government said on Monday. Aiman Mayzek, the head of the Muslim council, initiated the meeting which took place in a hotel room in Berlin but lasted for less than an hour before ending acrimoniously. He said after the meeting that the AfD had been unwilling to discuss the anti-Islam policy and preferred to "dictate" how the Muslim council should deal with animal slaughter and how mosques should be built. He said it was clear the AfD would continue to "follow the path of populism, defamation and prejudice". Last week, the party joined forces with the Patriotic Europeans against the Islamisation of the West (Pegida) protest group for the first time, to protest against the building of a mosque in the city of Erfurt. After the AfD voted that Islam "did not belong to Germany", Mr Mayzek said publicly that it was a party "from the Third Reich". Ms Petry of the AfD said that she was personally offended by the Nazi comparison and that she and other delegates had "asked politely several times" for the comparison to be retracted. She said that, without that retraction, the meeting was unable to "achieve what we considered the aim of the discussion", which was "how to work with the differing values of a still politicised Islam and a secular society". The AfD was started three years ago with a Eurosceptic message and has attracted voters who are angered by an influx of migrants and by Chancellor Angela Merkel's pro-refugee approach. Figures out on Monday show a steep rise in the number of right-wing extremist crimes in Germany. There were 23,000 attacks in 2015, an increase of 35% from the year before. These include instances of racist or anti-Semitic graffiti but also violent attacks. In some cases, refugee housing was firebombed, flooded or burnt down, while in others, migrants were targeted. Germany took in more than a million asylum seekers in 2015 and although the number of incomers has dropped substantially, their integration is still a controversial political topic. At the start of May, AfD members adopted an explicitly anti-Islam policy, declaring that the religion was "not part of Germany" and calling for a ban on minarets, the call to prayer and the full-face veil.